An overwhelming number of lawmakers voted Thursday evening in favor of legislation that would legally bar the Obama administration from making further cash payments to Iran amid a congressional investigation into how the White House secretly sent nearly $2 billion in U.S. taxpayer dollars to Tehran in what many have described as a ransom payment. 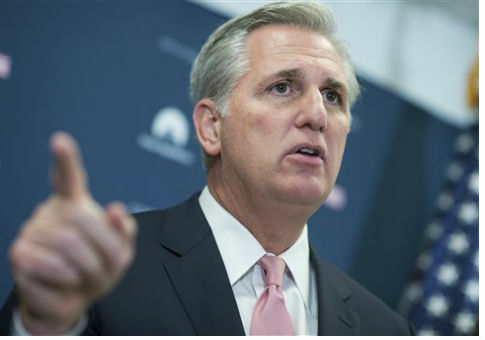 House Majority Leader Kevin McCarthy (R., Calif.) praised the bill’s passage, telling the Washington Free Beacon on Friday that Congress will not permit the Obama administration to continue providing Tehran with a U.S. taxpayer-funded financial lifeline. While the Obama administration has threatened to veto the bill, McCarthy said the majority of Congress disagrees with the administration’s decision to pay Iran $1.7 billion prior to the release earlier this year of several U.S. hostages. "The Obama administration paid a cash ransom to Iran for American hostages," McCarthy told the Free Beacon. "No matter how the Obama administration chooses to redefine this payment, the message to Iran is crystal clear: You will be rewarded for taking hostages—not punished." "There’s no other way to describe sending a planeload of unmarked bills to Iran and holding the plane on the tarmac until hostages were released," the Republican lawmaker said. "The House voted last night to put a stop to this now by barring all cash payments to Iran, reasserting the principle that President Obama violated that America doesn’t pay for hostages." The bill to prohibit further cash payments to Iran passed the House by a vote of 254-163. The Obama administration has vowed to veto the legislation, a move that has led to speculation by Congressional insiders that the White House is seeking a pathway for future payments to Iran. One senior congressional aide working on the issue told the Free Beacon on Wednesday that the administration’s veto threat is a sign that more payments may be coming down the pike in the months before Obama’s term ends. "There is no credible reason for the administration to oppose this bill. We already know, contrary to what the president initially said, that the administration can in fact wire money to Iran," the source said. "So why do we need the option to pay in cash? Simple. This money can fund terrorism, and there’s nothing we can do to know of stop it." Leading GOP senators have already expressed support for their own version of the bill, with several informing the Free Beacon that they intend to do battle with the White House’s Democratic allies. "This effort by the president to defend his ransom payments to Iran at all costs amounts to doubling down on ‎a policy that has made Americans less safe," Sen. Marco Rubio (R., Fla.) told the Free Beacon late Wednesday. "Democrats may be swayed by this threat, but I will continue to fight to prevent the U.S. government from sending taxpayer dollars to the world’s foremost state sponsor of terrorism." Other leading critics of the cash payment to Iran have expressed concern that a large amount of cash, which is untraceable, will be used by Iran to fund its global terrorist operation. The administration was found to have moved forward with the payment, despite a Supreme Court ruling ordering that Iran pay the American victims of terrorist more than $55 billion in damages. "Under U.S. court judgments, Iran owes $55.6 billion to American victims of Iranian terrorism," Sen. Mark Kirk (R., Ill.) told the Free Beacon earlier this week. "The administration should stop finding ways to send more cash to Iran, and start working to bring a measure of justice to American families whose loved ones were killed or injured due to Iran-backed terrorists." This entry was posted in National Security and tagged Congress, House of Representatives, Iran, Kevin McCarthy, Marco Rubio, Mark Kirk, Obama Administration. Bookmark the permalink.